RS Steel, a leading steel rods manufacturing company in Sri Lanka, celebrated the dawn of the New Year with its Chairman Dr. Ramesh Shivalingam at its factory premises in Uswetakeyyawa. 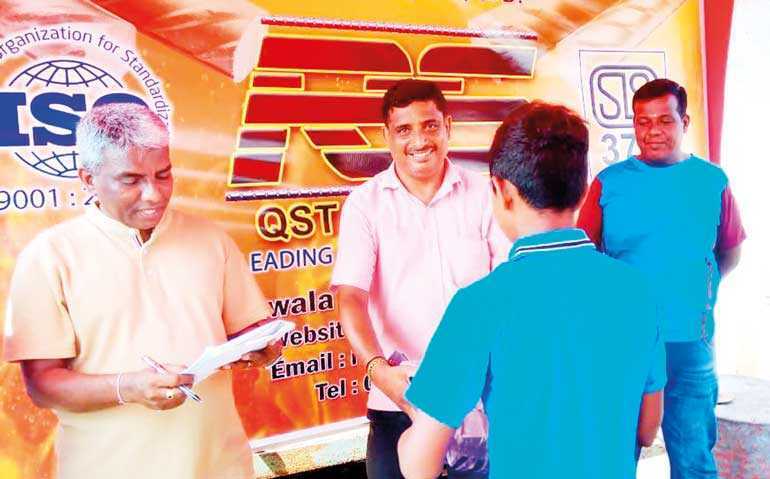 The significance of the celebration was school children of RS Steel workers and children in the vicinity receiving school books and stationary needed by them from Dr. Shivalingam. The Chairman individually incurred all costs and the donations took place for the sixth consecutive year. Participants of the occasion were family members of Dr. Shivalingam, RS Steel Deputy Chairman Maithree de Silva, RS Steel senior management and social workers of Uswetakeyyawa. Apart from children of RS Steel workers, children from Pubudugama, Manelwatte, Uswetakeyyawawa and Nugape villages and also the Montessori children of Uswetakeyyawawa Roman Catholic church were lucky to receive schooling gear. Dr. Shivalingam speaking at the occasion said his company commenced work every year by engaging in a mammoth CSR project aimed at fulfilling needs of schooling children. “We have commenced the year 2019 by donating school books and stationary to the children in the vicinity of RS Steel factory. The earnest wish of our company is to see these children grow up with proper education. We wish to see the future generation of Sri Lanka being groomed well to become wise and educated citizens,” he said. RS Steel Company’s product RS QST RB 500 steel rods is made to international standards with the best quality imported iron billets with latest technology and chemicals to add extra strength. The Sri Lanka Standards Institute awarded SLS 375:2009 standard certificate to RS QST RB 500 steel rods in 2015. RS Steel Company commissioned in 2010 manufactures a range of steel rods with the RS brand name catering to the building manufacturing sphere in the country.